American Express Travelers Cheques are just like cash, with the added benefit of offering more convenience and security. Travelers Cheques are safer than cash because if they are ever lost or stolen, they may be refunded. 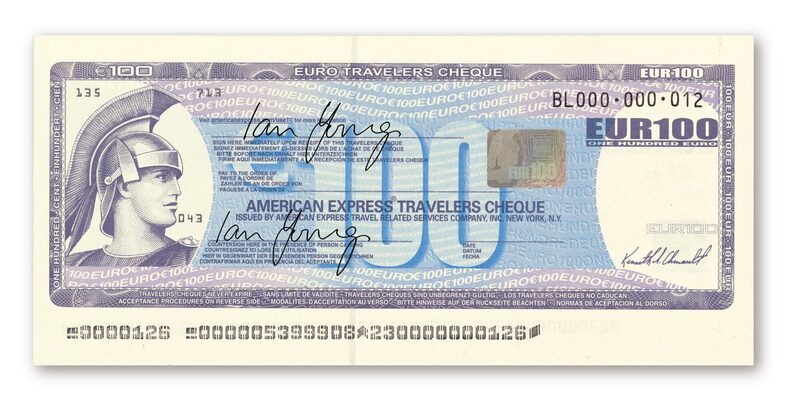 There are thousands of banks and foreign exchange partners in countries around the world where you can exchange your American Express Travelers Cheques for local currency. You may also use your Travelers Cheques like cash to pay for products and services at accepting retail locations, restaurants and hotels. What Is American Express Travelers Cheque? 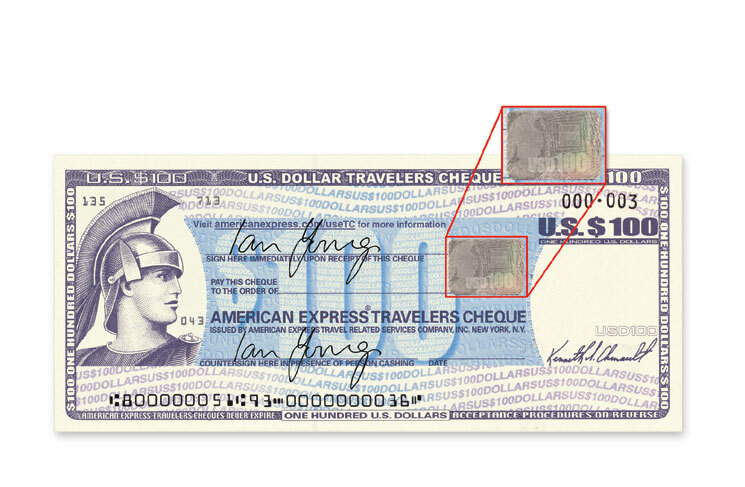 The Travelers Cheque is a financial instrument originated by American Express Company in 1891. 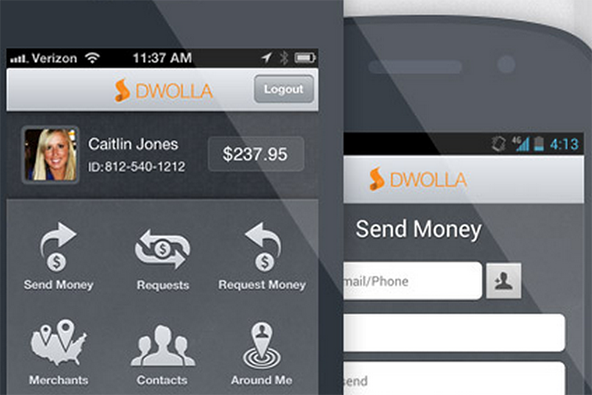 It provides users with a convenient and safe alternative to carrying cash. 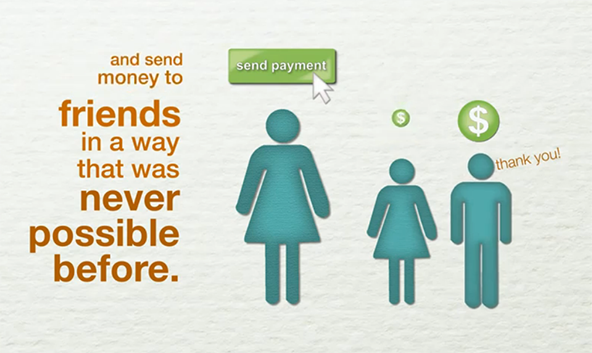 The traditional cheque was designed for one purchaser and one user. Unlike cash, however, lost, stolen or destroyed Travelers Cheques may be refunded. Technically, an American Express Travelers Cheque is an order drawn on the issuer to pay the named payee or holder, on presentation, the indicated amount of the Cheque. It is negotiable only when countersigned by the original purchaser and may be made payable to the order of anyone designated by the purchaser at the time of use. Cheques are offered in various denominations. 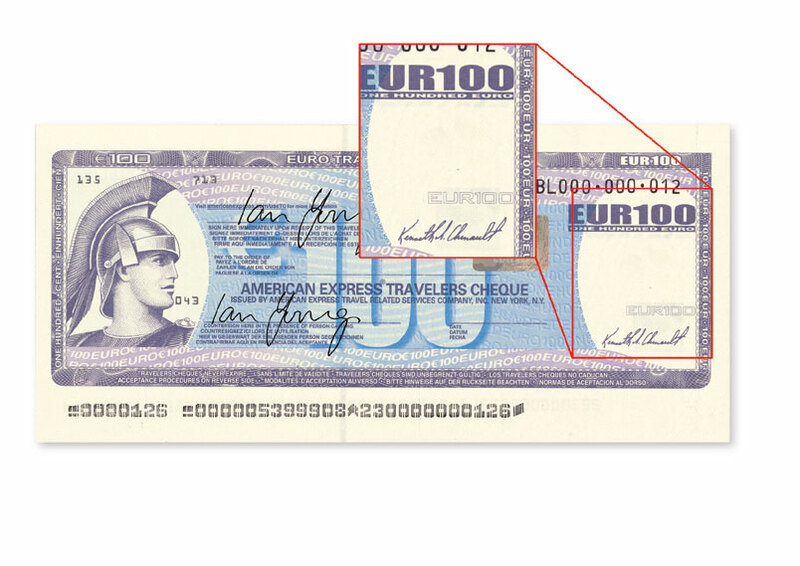 For example, U.S. currency Travelers Cheques are issued in the denominations of $20, $50, $100, $500, and $1,000. The issuance of $10 Cheques has been discontinued. 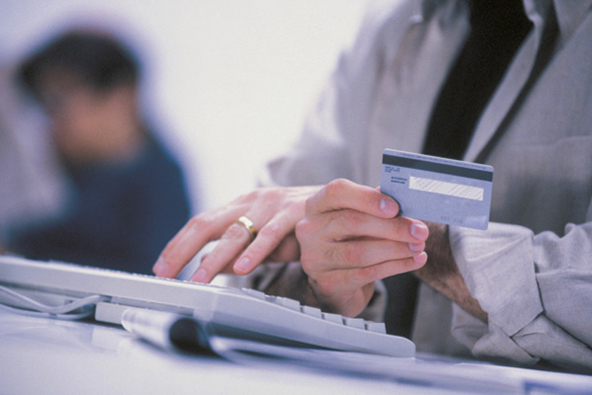 You can purchase Travelers Cheques at thousands of banks and credit unions. It is highly recommended that you call the location prior to your visit and verify fees, limits, payment methods, restrictions, exchange rates and availability. Commission fees may apply and can vary by country and / or exchange partner. Gift Cheques – The Gift Cheque was first introduced in 1987 as a convenient, safe and elegant way to give money and to compete in the gift certificate market.The purchaser is not required to sign the signature line at the time of purchase, because the Cheque is intended for someone else. Gift Cheques are refundable to either the purchaser or the recipient, depending on who was last in possession of the cheque when it was lost or stolen.They are sold individually with their own purchase record and refund information. 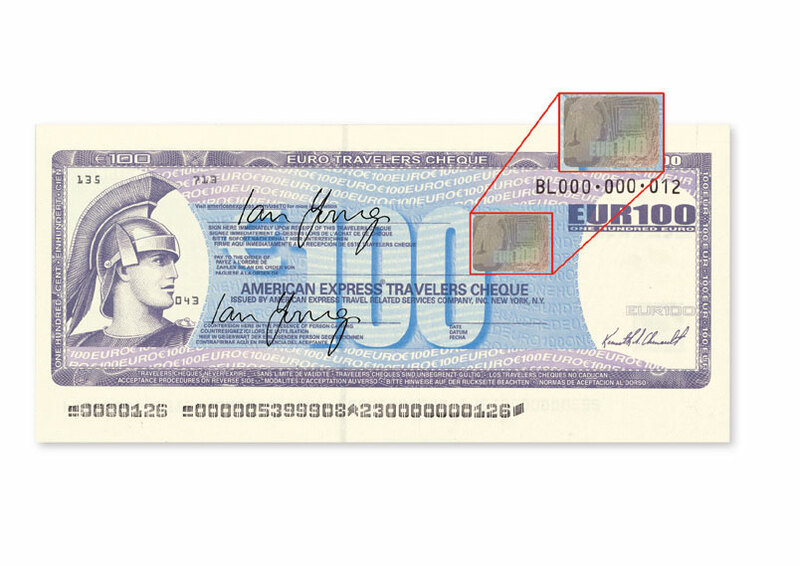 Encashment procedures are identical to that of the Travelers Cheque ($10, $25, $50 and $100 only). 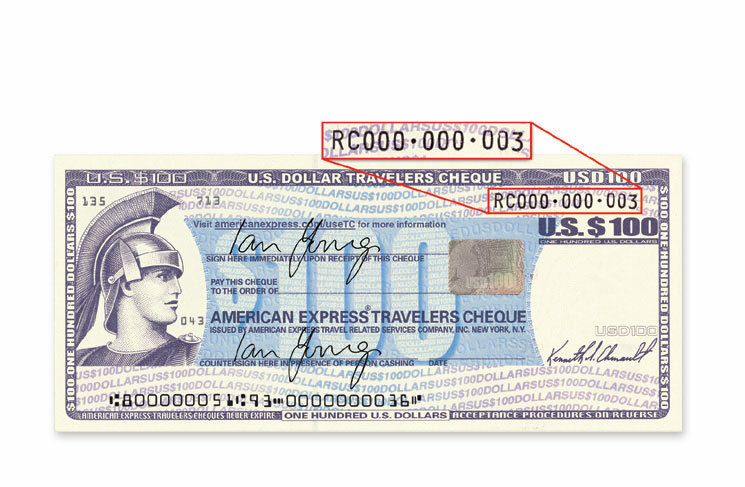 Cheques for Two – These cheques were launched in 1992 and are almost identical to the standard American Express Travelers Cheques. The only exception is that two signature lines appear in the upper left-hand corner The words “Signature I” and “Signature 2” appear over the signature lines. Cheques for Two are available only in U.S. currency. As indicated by its name, Cheques for Two authorize two people to use the cheques. The purchaser and his/her companion must sign the cheques as soon as possible. Either matching signature can be used for the countersignature. Record and keep separate – Write down your serial numbers and keep them with you when you travel, separate from your Travelers Cheques. 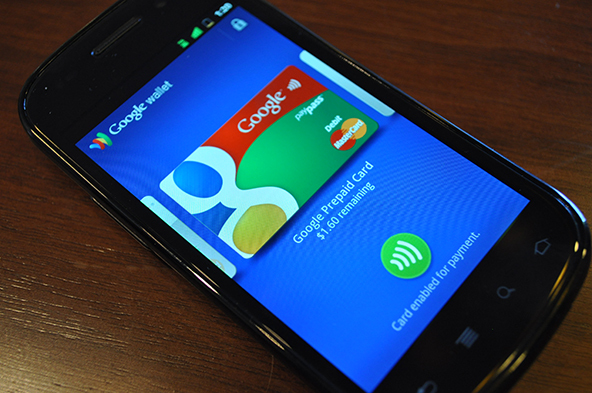 Use – To pay, sign your Travelers Cheque in the lower left-hand corner in front of the person accepting your cheques. Use your Travelers Cheques to pay directly for goods and services at accepting retailers, restaurants and hotels (see below). Photo identification may be required. It is strongly recommended that you retain and carry your original purchase receipt with you when you travel. Commission charges may apply and can vary by country or exchange partner. Exchange limits may apply due to local regulations and exchange policies. American Express does not guarantee that places will accept Travelers Cheques as a form of payment. Outside the USA, such usage is less common. Always check with the merchant first. You encounter an issue while trying to use your cheques. A service provider is unfamiliar with how to accept your cheques. To obtain a refund for lost or stolen cheques. Remember to have the serial numbers of your cheques with you when you call. For other locations not listed in the table above, please call collect to the USA +1 801 964 6665 or visit americanexpress.com/useTC. EUROZONE COUNTRIES: Travelers Cheques acceptance in the Eurozone is very limited away from airport locations. This document indicates partners who, at the time of publishing, were known to be encashing Travelers Cheques for non-account holders. You are strongly advised to use the TC Locator americanexpress.com/useTC to confirm the latest position. The acceptance of American Express Travelers Cheques is based on two principles: authentication and authorization. These principles give a cheque acceptor the best possible protection against accepting a fraudulent item that might not be honored by American Express. Authentication is the process whereby the acceptor validates both the presenter and the cheques. The Presenter – Through the standard Watch and Compare procedure. The Cheque – By identifying the security features and ensuring that there are no visible signs of alteration to the cheque or the original signature. Authorization is the selection of one of the cheques from those presented and submitting the serial number for verification by AmEx’s Positive Authorization system. 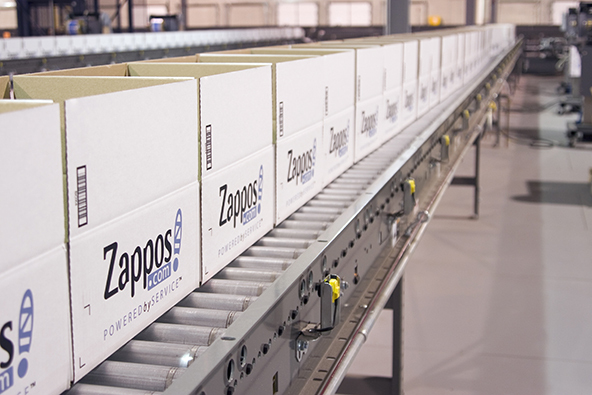 The system performs a series of checks against the serial number to ensure that it is eligible for encashment. 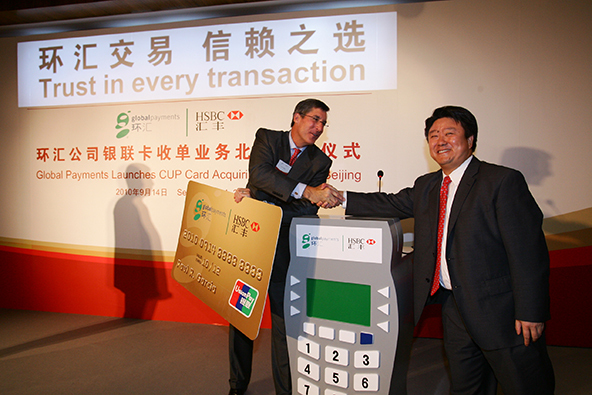 If the cheque passes, the system gives the acceptor an approval code which must be written on all cheques presented. If authorization is declined, the acceptor is given a telephone number (usually toll-free) to call for clarification – this could still lead to the cheque being approved. The authentication process must be performed first before seeking authorization. An approval code has no meaning if you establish that the presenter and / or the cheque are not genuine. American Express Travelers Cheques are just like cash and few products offer more convenience or security. But because there are counterfeits being circulated worldwide, you must ensure that the American Express Cheque products presented at your location are valid before accepting them. 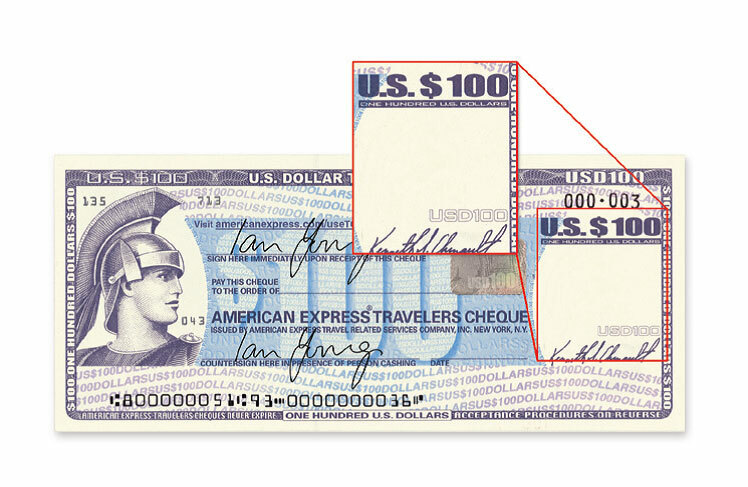 All American Express Travelers Cheques are printed on special watermarked paper. The text, border and picture on the face of the cheque are printed from steel engravings that give a relief effect and emphasize sharpness and clarity of details. Magnetic ink characters or other machine-readable characters are printed in the lower left corner to permit automatic cheque handling. American Express Travelers Cheques are valid without time limit. Therefore, cheques of earlier issue may continue to be presented for payment indefinitely. Watermark – Watermark of the Centurion is visible when held to the light. 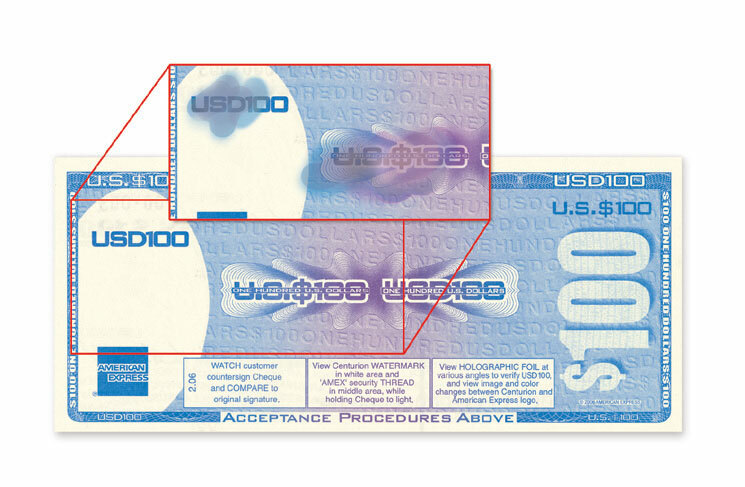 Holographic Foil – The holographic foil shows shifting images of the currency and denomination, Centurion and American Express logo when tilted. 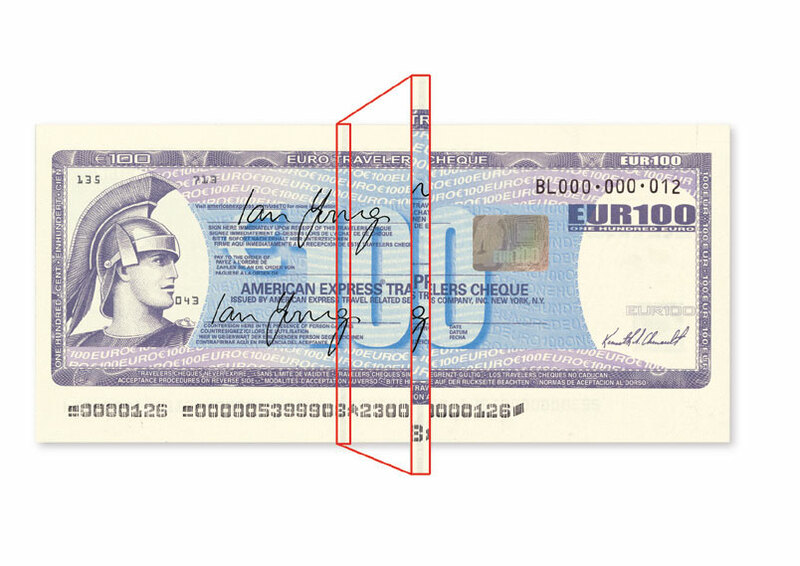 Security Thread – A metallic Security thread reading “AMEX” is embedded in the cheque and can be clearly seen from both sides when held up to the light. 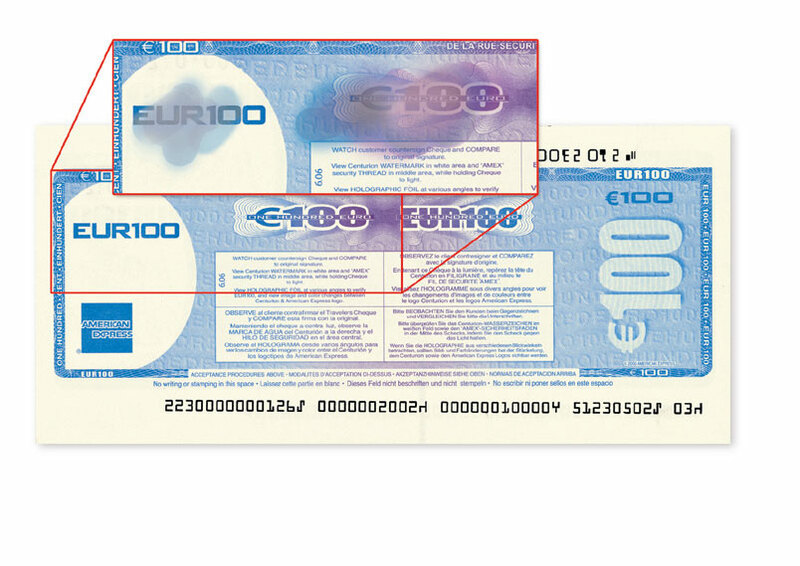 Smudge Test – Both left denomination panels on the back of the cheque smear when wet and the right panels do not. It is one of the easiest and most effective tests for cheque authenticity. 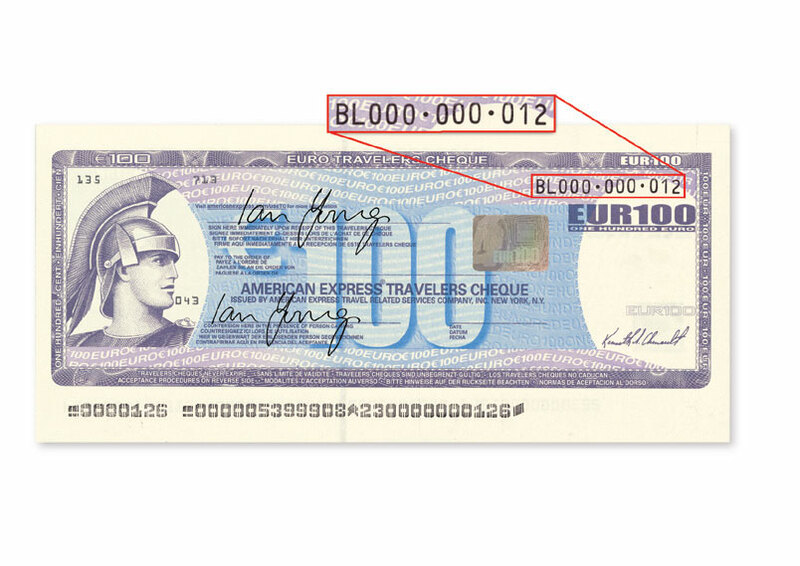 Serial Number – Each cheque has a unique serial number. Lost and Stolen Cheques – These generally are associated with losses of other property from customers. When stolen, they are usually connected to another crime. Blank Losses – Losses of blank cheques originate with robberies and burglaries of selling outlets and larcenies of shipments missing in transit. Another area of loss involves what is most often termed “SneakThefts” larceny committed in a bank or financial institution and achieved by distraction. The key to criminal success in sneak thefts as well as in large burglary rings lies in the criminal’s willingness to travel.Victim locations are selected in smaller urban areas where such activity was previously rare or unknown. The American Express Security Department can play a vital role for law enforcement in these situations, acting as a clearing house for investigative information. Fraudulent Refund Schemes – Such schemes attempt larceny by deception. A Travelers Cheque purchaser reports cheques lost or stolen and applies for a refund, having already cashed the cheques (or having had them cashed by a confederate). 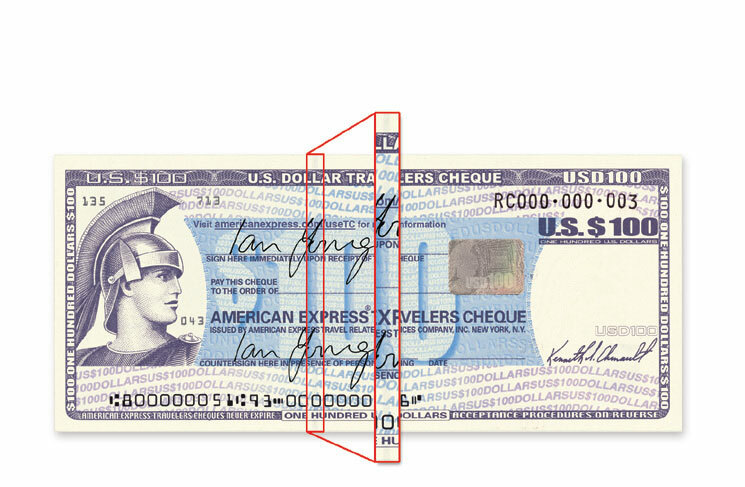 Counterfeit – Because of the liquidity of the cheque, American Express is often the victim of counterfeiting much like that with U. S. Currency. Quite often, the same criminal groups are involved. In those cases where a counterfeit cheque is suspected, the field tests previously delineated (smear test, etc.) should be applied. A call to the 24-hour 800 number should resolve any further questions. Counterfeiting by Color Copier / Color Digital Computer Scanner – The ever-increasing refinements in the field of document reproduction now present a significant threat to any issuer of security documents. Images are digitized, capable of being manipulated and altered. Storable, they can then be reproduced on a color copier or other color printer. Such counterfeiting operations can be conducted by one individual. Erasure or chemical eradication of the signature (upper) line. Use of a felt-tip pen to disguise alterations or trace type forgeries. “Dry pen” technique issued by experienced passers at the point of encashment. The countersignature has already been traced or simulated as the passer with a dry pen pretends to sign the cheque. Alterations of serial number and magnetic microline are used to neutralize authorization calls. Alterations / raising of denomination buttons to increase profitability of lower denomination, e.g., $20.00 to $500.00. Step 1 – Watch and compare. WATCH the customer countersign the cheque, and then COMPARE the signatures for a reasonable match. Check that there are no additions or alterations to the original signature. and ensure that there are no visible signs of alteration to the cheque. 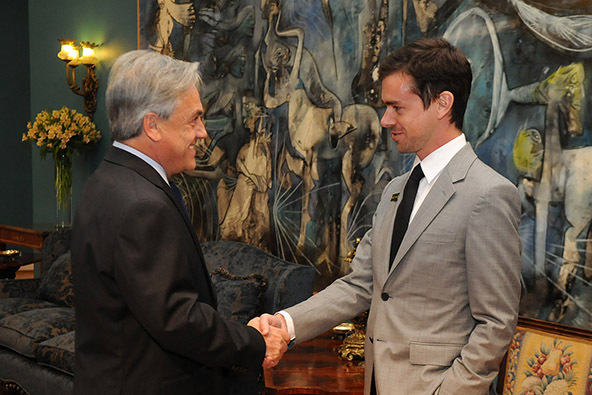 Step 3 – Obtain authorization. 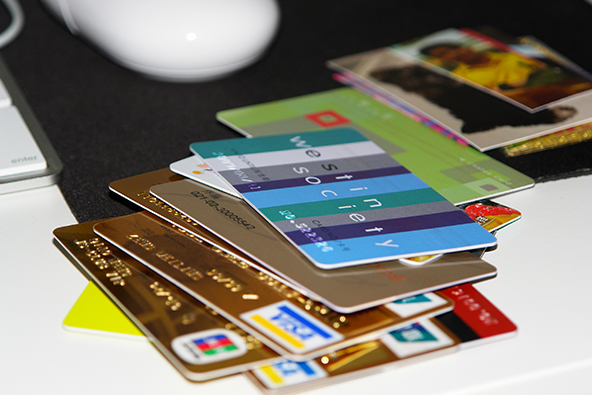 There are various methods offered by American Express to obtain authorization. Internet – Online Travelers Cheque Authorization (web-based browser) at americanexpress.com/verifyamextc. IVR (Interactive Voice Response): USA 1-800-525-7641. What if I did not see the cheques being signed? It is essential that you see every cheque being countersigned by the customer. If necessary ask the customer to sign again on the back of the cheque(s) while you WATCH and COMPARE. What if I suspect a forged signature? Ask the customer to sign the reverse of the cheque and compare the signature to the original signature on the front of the cheque. Still suspicious? 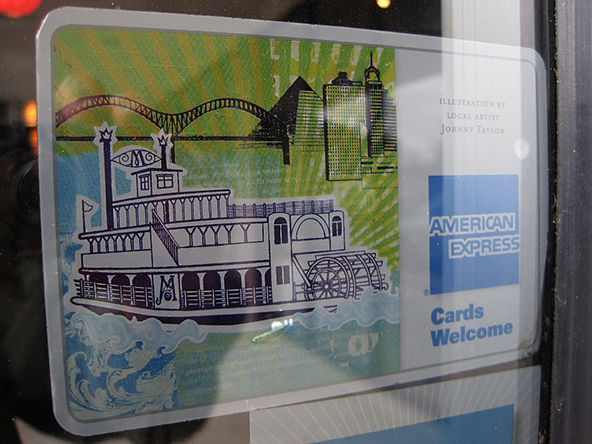 Call American Express at the number shown in Step 3, option B. 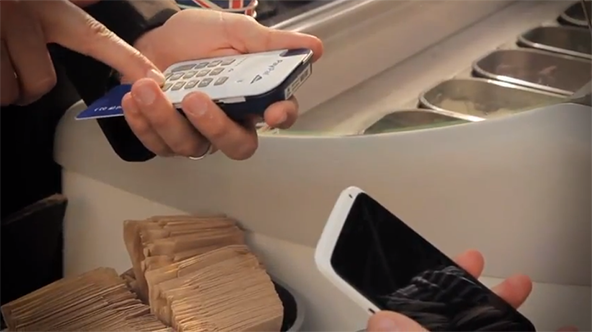 Press “0” at the end of the transaction to be transferred to a representative. What if the customer said he / she received the cheque(s) as payment for services rendered or goods he / she sold? Authenticate and authorize them to ensure their validity. Please refer to Step 3. As this is regarded as a third party transaction (cheques are not being presented by the original purchaser and you cannot WATCH and COMPARE), you should accept these cheques on a collection basis and wait for them to clear before releasing funds to the customer. However, do authenticate and authorize them to ensure their validity. What do I do if I suspect a counterfeit or altered cheque(s)? Call American Express at the number shown in Step 3, option B. 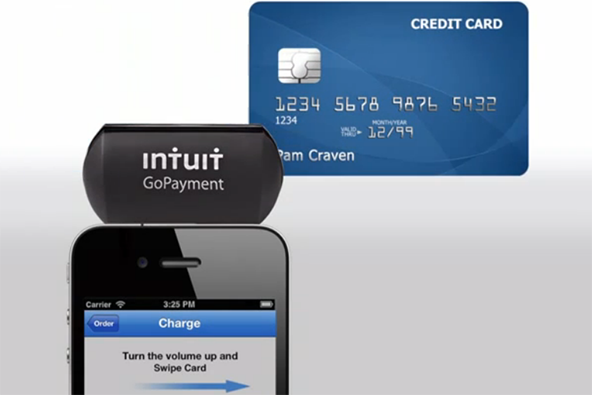 Press “0” at the end of the transaction to be transferred to a representative. Explain to the representative why you suspect the cheque to be counterfeit or altered. The call center will then connect you to the Security Department of American Express who will give you further advice. Please remember not to place yourself or your colleagues in danger. 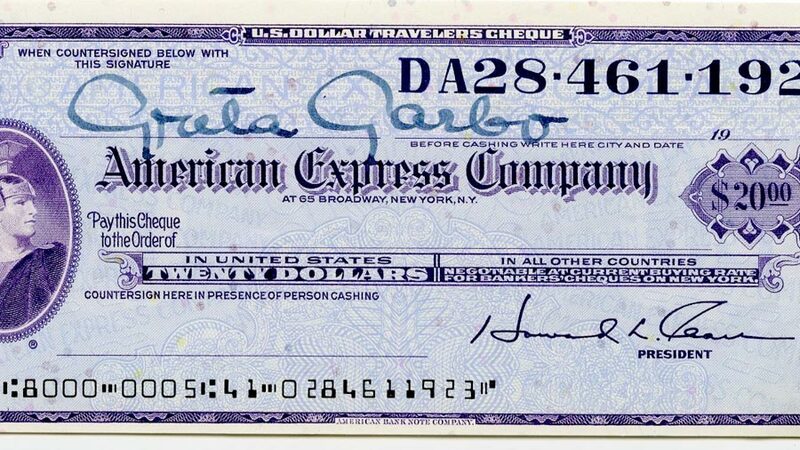 Image: A Greta Garbo-signed American Express Travelers Cheque. Credit: Goldin Auctions.